Scrotal wall edema is a very frequent consultation request to the inpatient urology service. Many patients tend to have congestive heart failure, but the majority of cases are idiopathic in origin (Brandes et al. 1994). 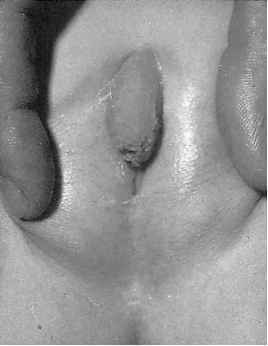 It is important for the physician to examine the scrotum and perineum and ascertain that there are no areas of skin breakdown, or referred swelling from a perineal abscess. Equally importantly, patient and careful squeezing of the edematous fluid out of the scrotum and away from the testes will allow for careful testicular palpation, so that epididymo-orchitis or other testicu-lar abnormalities can be ruled out. Management of scrotal edema is purely supportive. The scrotum should be elevated with towels and the patient kept in a supine position, if possible.